The Dallas Texans of the new American Football League were coming off of three straight losses and had a 2-4 record as they faced the Denver Broncos on October 30, 1960. 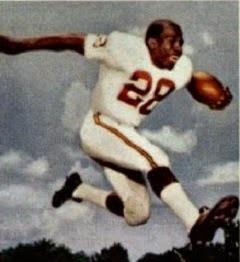 Owned by the league’s founder, Lamar Hunt, and coached by Hank Stram, the Texans had a good defense and an exciting all-purpose weapon on offense in rookie HB Abner Haynes (pictured above). Split end Chris Burford was good, too, but QB Cotton Davidson lacked consistency and passing accuracy. Denver, coached by Frank Filchock, was less talented overall but had a better record at 4-2. 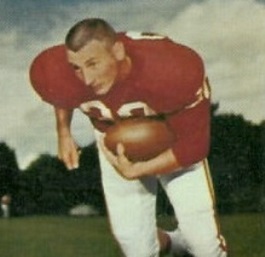 QB Frank Tripucka, a 32-year-old CFL veteran, directed the attack with little ground support (especially at fullback), other than ex-Green Bay HB Al Carmichael. Unheralded end Lionel Taylor was coming on as a possession receiver. It was a cold, clear day at Bears Stadium with 13,002 fans in attendance. The Texans took the opening kickoff and drove into Denver territory with Abner Haynes and FB Jack Spikes running effectively. But facing second-and-11 at the 17, Cotton Davidson’s deflected pass was intercepted by safety Al Romine. However, Dallas got the ball back two plays later when Al Carmichael fumbled and LB Ted Greene recovered at the Denver 37. The Texans didn’t come up empty, scoring in four plays. The biggest was a screen pass from Davidson to Haynes that covered 34 yards and Spikes scored a touchdown standing up from a yard out. Spikes, who doubled as placekicker, added the extra point and the visitors led by 7-0. The teams exchanged punts before the Broncos put together a 61-yard drive in three plays. Frank Tripucka threw to end Lionel Taylor for 14 yards and, after another long pass was almost picked off, Carmichael (pictured below), making up for the earlier fumble, broke away for a 47-yard TD. Gene Mingo converted to tie the score. As the game moved into the second quarter, a three-and-out series by the Texans ended with a punt and the Broncos did the same. However, DB Clem Daniels fumbled the kick and OT Eldon Danenhauer recovered for Denver at the Dallas 31. Tripucka completed passes to Gene Mingo, a halfback as well as kicker, and Carmichael to reach the 16, but Taylor lost two yards on an end-around and Tripucka’s next two aerials were overthrown. Mingo attempted a 26-yard field goal that was wide to the right and the home team came up empty. The clubs again traded punts before the Texans put together an eight-play, 64-yard drive. Haynes ran the ball five times for 19 yards and caught a swing pass for another ten, and his last carry of three yards was good for a touchdown. Spikes added the point after to put Dallas back in front by 14-7. The Broncos drove into Dallas territory on their next series. Tripucka passed to Mingo for 18 yards to midfield on a third-and-eight play and two defensive holding penalties on the Texans helped keep the drive alive. But after reaching the 24, HB Bob Stransky fumbled after catching a pass and DT Ray Collins recovered for Dallas. The first half ended with Dallas still in front by seven. Denver started the third quarter off with a short possession and punted. Starting from their 20, the Texans moved methodically down the field. Davidson threw to Chris Burford for 15 yards to convert a third-and-seven situation and, after Haynes and Spikes ran the ball to the Denver 22, Davidson completed a third-down pass to Haynes for 14 yards to give the visitors a first-and-goal at the eight. Davidson’s first down pass was incomplete, but he connected with Haynes on second down for a five-yard gain to the three. Spikes plowed down to the one and, electing to go for it on fourth down, Davidson kept the ball on a quarterback sneak but was stopped a foot short of the goal line. The Broncos ran three times and punted, and the Texans regained possession at the Denver 49. Once again the Texans chipped away as Spikes gained eight yards and Haynes six. Davidson threw to Burford for a 25-yard gain to the ten yard line but the drive stalled at the four and Spikes booted an 11-yard field goal. Dallas was now up by 17-7. On Denver’s second play following the ensuing kickoff, Tripucka’s pass was intercepted by Daniels at the Broncos’ 26. However, the opportunity for the Texans to pad the lead was lost when Haynes fumbled and DE Chuck Gavin recovered for the Broncos at the Denver 16. On the first play of the fourth quarter, a Tripucka bomb was intercepted by CB Duane Wood at the Dallas 10. The Texans picked up nine yards and punted, but retained possession when Carmichael fumbled and OT Jerry Cornelison recovered at his 42. Two plays later, CB John Pyeatt intercepted a throw by Davidson to give the Broncos the ball at their 24. It didn’t look promising when Tripucka was sacked on first down by DE Paul Miller for a ten-yard loss, but after Mingo gained back four yards, on third-and-16 Tripucka threw to Carmichael for 22 yards. Carmichael picked up another five yards shortly thereafter and then Tripucka connected with HB Bob McNamara on a play that covered 55 yards for a touchdown. Mingo converted and the Broncos were now three points behind with 8:48 to play. The Texans managed to convert two third downs as they ran the clock down to just over three minutes on their next series, but after reaching the Denver 47 they had to punt. Tripucka came out throwing, completing six passes, two of them on third down plays, to get the Broncos to the Dallas 21. McNamara dropped a pass at the 15 and Carmichael lost a yard on a draw play, setting up a 29-yard game-tying field goal attempt by Mingo. The kick was wide to the left and Dallas came away with a 17-14 win. The Texans had the edge in total yards (308 to 302) and first downs (19 to 13). Denver turned the ball over five times, to four suffered by Dallas, while the Broncos recorded four sacks, to two by the Texans. Abner Haynes was typically productive in his all-purpose role, rushing for 81 yards on 27 carries that included a touchdown, catching 7 passes for 96 yards, and returning two kickoffs for 38 yards. Cotton Davidson completed 12 of 23 throws for 187 yards and gave up two interceptions. Chris Burford contributed 78 yards on four pass receptions. Jack Spikes (pictured below) gained 50 yards on 18 rushes that included a TD and also kicked a field goal in addition to both extra points. For the Broncos, Frank Tripucka was successful on 14 of 31 aerials for a TD as well as two interceptions. Al Carmichael ran for 61 yards on six attempts that included a touchdown and also caught three passes for 40 yards. Gene Mingo had a team-leading four receptions for 50 yards in addition to 42 rushing yards on 8 attempts, but missed both of his field goal tries. 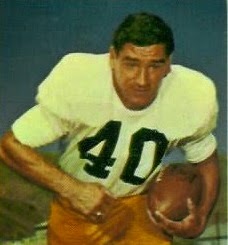 Bob McNamara had the most receiving yards with 55 on his lone scoring catch. The team’s fortunes shifted as the season continued. Dallas went on to win its next two games, including the rematch with the Broncos, and finished strong for an overall 8-6 record that placed second in the Western Division. Meanwhile, Denver didn’t win another game, while tying one, and ended up at the bottom of the division at 4-9-1. Abner Haynes had a spectacular first year, leading the AFL in rushing with 875 yards on 156 carries (5.6 avg.) and in all-purpose yards (2100) thanks to his team-leading 55 catches for 576 yards, 215 yards on 14 punt returns (a league-leading 15.4 avg. ), and 19 kickoff returns that totaled 434 yards. He scored 12 touchdowns and was named AFL Player of the Year by UPI. Al Carmichael ran for 211 yards on 41 attempts (5.1 avg.) and added 616 yards on 32 pass receptions (19.3 avg. ), scoring a total of seven TDs, before a leg injury ended his season in the tenth game. Gene Mingo had better kicking performances as he led the AFL with 18 field goals, a 64.3 field goal percentage, and 123 points. Frank Tripucka led the league in pass attempts (478), completions (248), and yards (3038), but also interceptions (34).